Russell Wilson Wants To Leave Seahawks? Tomorrow is tax day, and it’s also Russell Wilson‘s deadline for a new contract with the Seahawks. We have explored the dynamic between Wilson and Seattle at length over the past couple of weeks, but Mike Florio of Pro Football Talk has now added a new wrinkle to the conversation. Florio hears from a league source that the Seahawks believe Wilson wants to play elsewhere, and that Wilson will therefore drive a harder bargain with Seattle than he would with another club. 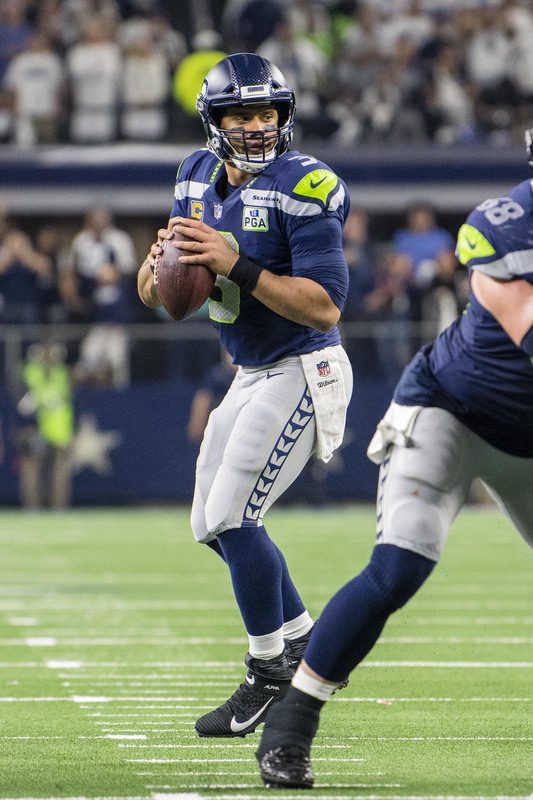 Of course, Wilson is still under contract through the end of the 2019 campaign, and the Seahawks could realistically deploy the franchise tag in 2020 and 2021 if they so choose (and though Wilson could always change his mind, he has indicated he would not hold out if he is hit with the franchise tag). But as Florio observes, it remains unclear whether Seattle wants to commit to the kind of money that Wilson would earn under the franchise tag or the amount he would demand under a multi-year extension. And if he is willing to take a little less to play with another club — like the Giants, who have been rumored as a potential destination for some time — then it would become easier for the Seahawks to deal Wilson under a tag-and-trade scenario (interestingly, new Chiefs safety Tyrann Mathieu, whose respect for Wilson is well-known, tweeted a response to Florio’s piece that said, “Russ wants New York”). This could just be the type of pie-in-the-sky rumor that frequently shrouds negotiations with star players. It is still eminently possible that Wilson and the Seahawks hammer out a third contract, or that the two sides roll with the franchise tag for at least the 2020 season, and maybe 2021 (the franchise tag number for 2022 is much too rich to be feasible). Nonetheless, it is still interesting to ponder, especially considering the juggernaut that the Seahawks were able to build when Wilson was playing under his rookie contract. If they can land some high-level draft capital for Wilson next offseason, then they may be able to put together that type of roster again in short order. Russ Wilson to the Giants and then the Seahawks select a QB with one of the Giants first rounders? If he gets traded, unlikely it happens this year. They were a playoff team in 2018, and he’s only making $17MM this season. I said this two weeks ago but was laughed at. I was told no way he wants to leave Seattle and he isn’t worth two first round picks. Ciara wants to be in a bigger stage. This deadline being so early is it is easier to string Seattle along if you don’t negotiate. It is his ploy to get out our here. He’ll switch to baseball and play for the Yankees. Wilson to Titans … wow that would be a great fit. Florio is also a tool that is wrong 90 percent of the time. He takes every possible position in any situation so he can claim he is right when something happens. You must be Florio with a ghost account leaving messages on this site. I don’t get why Wilson would want to leave Seattle for football purposes. If he wants to get into media or something, I can understand the move to NY, otherwise it just seems like the giants aren’t going to commit significant draft capital to acquire a 30+ year old QB anytime soon… and he will be in Seattle via franchise tag another 2 years after 2019. Apparently the Sea Chickens don’t want to pay him that much money. They would rather spend it on their aging head coach. No cap for coaching staff and the Seahawks ownership has more money than anyone. If he doesn’t want to be here, then trade him to the Giants for multiple first round picks and rebuild the team. Seahawks should offer Russ to Giants for this year’s 17th, next year’s first (presuming a mid round pick with Russ as the QB) and Eli. Seahawks get 2 firsts which I assume they would demand, and a one year stop gap solution at QB with Eli. Pretty sure the conversation would start with both first round picks this hear, next years first and Eli and a player. No way N.Y. gives 3 first round picks+ on a 30yr. old QB. 2 first aren’t enough for a franchise QB. And the Seahawks wouldn’t be interested in Eli Manning, they could sign or trade for a qb that would be of similar production and at half the cost… looking at 3 1st rounders, plus other picks. The only comparable QB trade I can think of is Jay Cutler to the bears. That deal contained 2 firsts, plus other picks and Kyle Orton on a modest deal. Wilson is much more accomplished than Jay Cutler was at the time (and ever). Seahawks should expect (and demand) more. But I don’t expect the Seahawks to allow that. My guess is consecutive franchise tags into Wilson’s age 33 season, worst case scenario. Why athletes want to go to places like NY and LA (Lebron), spend over half their time playing for idiots like Dave Gettleman is beyond me. As if they cant just go to those places any time they want or conduct their off field business or whatever without being physically in said city. As if they dont get enough media attention anyway. Lebron couldve went to Algeria and gotten the same amount of attention but whaaaaaaaaatever. Have fun sitting out of the playoffs and no one wanting to play second fiddle to you (hey just like irl) in a dumb movie that doesn’t need a sequel. But they cant afford to their business away from savings cities? Back to your cave dunce. Deal him ASAP. You don’t want to be here gtfo. Take that supposed deal from the giants. Enjoy New York and 7-9 seasons until you retire. Eli being traded? Laughable. Who would even give a bag of marbles for him? No team other than Clueless Gettleman thinks he should even be holding a clipboard on a team more less start. Wilson will be 31, relies on his mobility, and seeking a max pay day. Pretty sure taking both Giants 1sts is the best they will do. Price goes down the longer you wait for those saying they control him beyond this year. Too bad the Jets traded all that draft capital for Darnold last season. Jets have the cap room for an elite qb. And have arguably a better roster than the Giants. Every QB wants to take a pay cut to play for a badly run organization that trades away it’s all pro WR….lol. 30 is not old for a QB. A halfback? Sure. But not a QB. That’s a QB that uses his legs a lot.